We went to a great party on New Year's Eve. It was potluck for supper and then lots of family fun. There were about 15 children there, from three months to eight years old. Our friends who hosted the party have a rink in their backyard and a hot tub in their basement! The kids enjoyed them both very much. They certainly didn't care how cold it was outside. 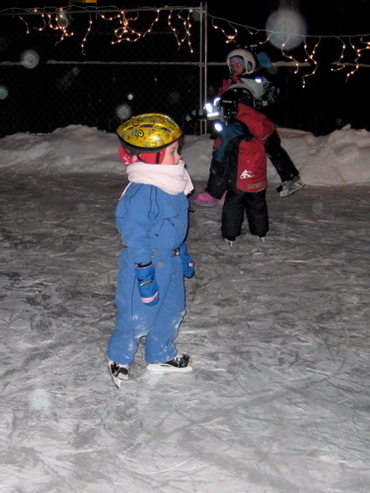 Sophia did not want to get off the ice! I was impressed with both Sophia's and Madeline's skating; they haven't been on skates since their lessons in May/June. 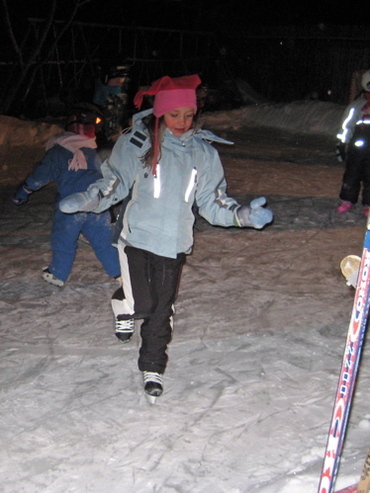 Fortunately, our friends (who have four young children of their own) are well-equipped and were able to lend both skates and swimming suits to our girls. We didn't take those things along as we failed to read the invitation close enough. But we did take a salad for the potluck! Sophia, Madeline, and Georgia all stayed up until the minute we drove away -- 12:48 a.m! Sophia was up at 8:00 the next morning (thanks to a nose bleed), but the rest of us were able to sleep in until 9:30 a.m. Miraculous!